Unveiling a New Starfinder Race: The Vesk! For months now, we've been teasing the fact that Starfinder has seven core races, of which only five have been announced—humans, androids, lashunta, kasatha, and ysoki. What's more, we've hinted that the remaining two would be brand new races you've never seen before. So now, for the first time ever, we present... the vesk! Resembling 7-foot-tall humanoid lizards with beards of spiky bone, vesk come from the nearest inhabited solar system to the Golarion system. Fiercely militant and highly organized, vesk have strict honor codes and social mores based on conquest and prowess in battle—a cultural focus that quickly led them to conquer all the other races in their solar system, establishing a massive empire called the Veskarium. For generations, their conquest ended there, stifled by the vast distances between stars. With the introduction of Drift travel, however, they quickly turned first contact with the races of the Golarion system into an all-out war of invasion (and inadvertently created the Pact Worlds as the governments of that system banded together in mutual defense). The brutal conflict lasted for centuries, until the sudden arrival of the Swarm threatened to annihilate all life in both systems. Forced to put aside their differences, the Veskarium and the Pact Worlds were able to join forces and drive off the Swarm, and the tenuous truce forged in that fight continues to this day—if only barely. While merchants and others with peaceful professions can advance economically in vesk society, political power is the exclusive domain of those who've proven themselves in armed conflict. Surprisingly, this proof doesn't need to come through military service, or even benefit the Veskarium. Many vesk attain similar elevation in social status through performing mercenary work, engaging in dueling, or providing security on exploration missions. Though obsessed with conquest, dominance, and social rank, vesk find an equally strong sense of honor and pride in fulfilling their agreements and treating subordinates of all races fairly. They are stoic and taciturn with strangers but capable of great bursts of emotion in private or in the heat of battle. Vesk society tends to be efficient, respectful, and law-abiding—especially since nearly any insult or violation of custom could trigger a brutally violent blood debt. Vesk adventuring with races from other systems fall into two categories. The first are mercenaries or glory-seekers looking for a chance to engage in honorable combat and build up their prestige. The second are nonwarrior vesk who have rejected their home society for its obsession with combat and have chosen instead to seek opportunities among more open-minded races. Warrior vesk most often fit the soldier class, though a growing number have become intrigued by the path of the solarian. Noncombatant vesk often lean toward becoming mystics, though some overcome the traditional vesk culture's dismissal of education to become mechanics or even technomancers. Stay tuned for more Starfinder blog posts in the coming weeks as we ramp up to the game's release at Gen Con 50! Looking cool and tough. Will there be a Vesk iconic? I'm betting the soldier iconic is a vesk. That would totally fit their brief description here. Interesting read, looking forward to seeing more of the Vesk and Starfinder! I Can't Believe It's Not Klingons™! Can't wait for these guys to meet Tucker's Space Kobolds. I wonder why Hobgoblins couldn't have just filled this role? No bony crests ala Triceratons? I suspect that after a few autodoors get turned into archways with slagged edges, other cultures would fix the bugs in their hatchway collision detection systems. The Ysoki would already have the tech and be good at refitting systems. Another reptilian humanoid, kind of disappointed. I was hoping for something a little more out there. I really like these guys. Lashunta were looking like a go to for me besides human, but these guys might give them competition. The culture may not exactly be original, but it still seems fun to play around in. 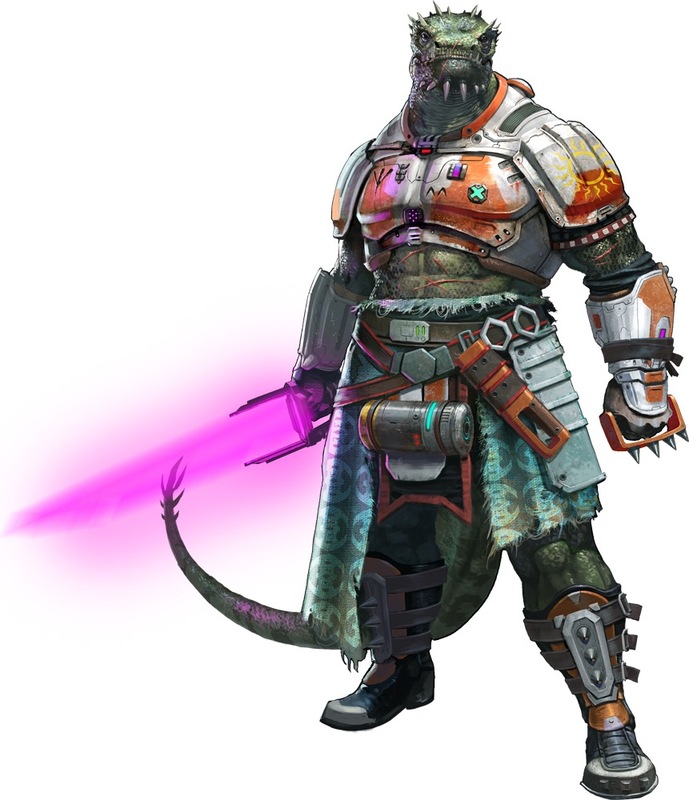 I may just make a Vesk Solarion as my first Starfinder character. Probably because they wanted "new" races for Starfinder. ...and one more to go. Is this confirmation that the "home" system is called "the Golarion system", after the missing planet rather than the star? Indeed. That's probably the same reason why we have Ysoki and not Dwarfs, or Lashunta and not Elves. Would've liked to see the lizardfolk NOT be the militant/warlike race but still a cool reveal! I... am just going to go giggle in the corner about the name. Nah, I'm just happy about space lizardfolk. Here is yet another picture of them on the Paizo Twitter account. You can also see images of Starfinder mini designs (including ships) and a group shot of some Starfinder adventurers. The group shot has another alien in it that does not appear to be something we have seen before. They do say that Veskarium (Vesk solar system) and the Pact Worlds joined forces, right? So that's probably how we are calling the "core solar system". Calling it "Golarion system" was probably the best way to refer to it so that we would understand. But I don't think the inhabitants of Castrovel, for example, refer to it as "Golarion" solar system, not even in the pathfinder setting. It's eerie that it's close to a finnish word for handbag considering the usual insult to reptilian things about turning them into a handbag, or boots. They are probably the Shirren, whatever they turn out to be. I am guessing that they will be the distinctly non-humanoid race, since all of the six races we know about are humanoid. Since we have the kasatha in the core races, it looked like the door was open for aliens without the 2 arms, 2 legs, 1 head limit. I was hoping for something really weird and alien. These guys are OK, but they feel a little like lawful space-orcs (big, strong, militant and uneducated). ...what's the swarm and when can I use it to attack my PCs? Paizo gave a presentation whose intro slide appeared to comprise an Ysoki ratfolk, an insectoid humanoid, a Small robot, a kasatha, a human, and an android. There is nothing on that slide that could possibly be a lashunta or a vesk. If we assume that the shirren mentioned in the compatibility license is a core race and that the intro slide shows no non-core races, then the robot would have to be a mechanic's robot companion and the insectoid humanoid would have to be a shirren. Hopefully we get variants based off of some weird Earthly lizards (frill-necks, or horned toads, and those sorts). I really like lizards and lizard-folk by extension, so I like them! In the most recent set of images on the paizo twitter, there is a new looking insectoid race standing next to some other races that have already been announced. I'd imagine that this is likely the Shirren. At least it appears insectoid. It has whiskers so my hope is insectoid, and not hyper intelligent catfish. Erik Mona mentioned playing less humanoid races in a Know Direction interview a while back. If I recall correctly the plan was to introduce those options once the game was released and a bit more "settled," but I may be misremembering or misinterpreting. WHOAH WHOAH WHOAH, HANG ON HERE. I take offence to this on behalf of the Ysoki. They compare better to gnomes than dwarves, they are an engineering tinker-ey race, and gnomes' physique is more similar due to the lack of brawn. Ysoki are like jawas: they build crap to sell and mess with, not to go to friggin war with it. Feeling pretty good about this prediction all of a sudden. It sounds like in the centuries post-Drift that the empire of Veskarium isn't necessarily limited to their home system either. I ask because this is the first time I've seen an official use of anything similar to "the _____ system" to refer to the home system from anything close to an in-universe viewpoint. Not everything in the home system belongs to the Pact Worlds, so calling it "the Pact Worlds system" seems off. Lukewarm on this race. Seems too much like the Jem'Hadar. The art is good, especially the skirt. Not too crazy about the mid-riff armour as that makes little sense to me. Otherwise well done. Is there much difference between males and females? I'm going to assume we are looking at two males? TerminalArtiste mentioned variants...I think that might make me more interested. First of all, I love this. I've wanted a Large Reptile race in Pathfinder FOREVER. Also, this is going to sound really weird, but I am noticing that all of the Vesk art so far trends toward the same general body type. Do the Vesk lack sexual dimorphism, or are they a hermaphroditic species? Cause that'd be WILD. I am very happy to not have to deal with Inexplicable Lizard T!&!. I know they are being compared to Klingons, being the originals on TV, but most Sci-fi shows these days have a "violent but honorable" race - the Neichiens (sorta) from Andromeda, the Luxans from Farscape, Jaffa from SG-1, The Narn sorta fit this archetype. A welcome addition. Can't wait for the next race. Should have seen this coming. Not disappointed. Also, this is going to sound really weird, but I am noticing that all of the Vesk art so far trends toward the same general body type. Do the Vesk lack sexual dimorphism, or are they a hermaphroditic species? Cause that'd be WILD. I am very happy to not have to deal with Inexplicable Lizard T~*%. Don't worry. I was wondering the same thing and read through the comments just to see if anyone else had thought about it. So yeah, are there male and female Vesk, or do they all look like this and essentially cover both sexual functions? Kling-lizards are a bit... hm. I get why you'd do a warrior race that dismisses science and knowledge. I even get why they'd be reptile mercenaries that dismiss science and knowledge (Hi, Wrex!) But something beyond what has Gorn before would have been... nice. But really, we've just got a tentative peace with the Feder... no, Allian... er, Pact, and a tendency for their warriors to show up as mooks being employed by anyone with the coin to do so. Need a hook to go with that trope. Since there are pictures of buggy and his pals, when does their write-up go live? we've hinted that the remaining two would be brand new races you've never seen before. ... and then precedes to reveal it's just a lizardfolk. At least the other race seems to be an insectiod one. These are so similar to Klingons! I myself am pleased with this new reptilian race. Vesk aren't mere lizardfolks and I'm sure rules will prove it. Even if they were, seeing the vesk as core means we are getting lots of npcs and options for than. I hope Starfinder grows enough so that we might see an NPC Codex (And a space ship codex *-*). Absolutely, it's a niche I feel people expect in a sci fi setting. And it's nice to have the core races be cultural touchstones like that. I'd rather have most of the core be recognizable rather than needing to introduce a bunch of really "out there" concepts to new players every time. I'm sure the non-Core races will throw some proper curveballs at us. I also like their look a lot. They seem more bulky than "cut" which works well for lizards and is an underrepresented body type all around. I wonder if the scale coloration on the left vesk is dyed or racial/gender related. Well, that's disappointing. What's the point of going off into space if the aliens look like humans with slightly different skin? I don't have a ton of experience with sci-fi RPGs, but I did play Star Frontiers back in the 80s. The starter box for that introduced five races, four of which were player races and one was the evil NPC enemy race. Only two of them were humanoid (humans being one). I was really hoping to see something like dralasites (amorphous blobs that can sprout limbs on the fly), vrusks (8 legged insectoids who have trouble swimming due to the placement of their air intake organ), or sathar (worm/snake like creatures with no legs). How'd you miss nagaji? According to the Advanced Race Guide, the males are 5'9" +2d10 inches. That means 6'10" average, maxing out at 7'7". Females are only 3 inches shorter. And they've got the racial strength bonus to prove it. Also, this is going to sound really weird, but I am noticing that all of the Vesk art so far trends toward the same general body type. Do the Vesk lack sexual dimorphism, or are they a hermaphroditic species? Cause that'd be WILD. I am very happy to not have to deal with Inexplicable Lizard T%@&. That I agree with completely. That sort of thing really bugs me. Though I did actually see it explained in a surprisingly good way in a comic book series once. In CrossGen's Sigil comic, the lizard people were intentionally taking on human characteristics, by stealing DNA from the humans they were at war with. Which is why it's a trope that I would have hoped they'd avoid, now that it's become such a cliche. I was hoping for something more original. While the artwork is fantastic, I'm kinda underwhelmed by what I've seen of the Starfinder races so far. With the core races, I think a part of the intent was to fill all the primary niches that a player would want to play. The heavy strength type was missing a race, and I think that often times, people like to play what they can see themselves being. So mostly humanoid races are easy to start out, with more complex races coming later on. They don't necessarily have to be humans in a different color, but it helps for the first few races to be relatable, for new players. More experienced roleplayers will find races that fit them later on, but a new player may have a hard time putting themselves into the mindset of a sentient cloud or an organism made out of several tiny organisms. Well, Kasatha probably deserve a question mark. They might be from Kasath (if it's actually nearby and not in Androffa's galaxy), but they might be from the bunch stranded in Numeria, and they had some sort of population boom in the intervening years and spread from Golarion into the local system. So they could be natives at this point. /nod. I suspect I'll usually just autofill race with 'human' at this point. I believe he was pretty emphatic about folks getting to play out there stuff e.g. floating sentient orb, so I definitely wouldn't write anything like your above examples off. They just seem to be starting with more relatable races, which I think makes sense. Couldn't have said better. This dragon fan here is waiting for the rules to play as a dragonkin that are included in the Alien Archive. I never dreamed about seeing something completely non humanoid as a core race - mainly because of the reason you just pointed - but I know there will be many options to play as dozens of creatures. People are too focused on the cosmetic aspects and are forgetting the mechanical aspect of a role playing game. They have to go easy on beginners, specially non rpg players.